The "How To" Practice Guide for New York Paralegals! This handbook is used by New York Paralegal students, graduates and members of the New York Legal Community. Originally published by James Publishing, the New York Legal Assistant Handbook is continually updated and revised by New York Paralegal Press. The handbook focuses on procedure, not theory. Most legal practice guides contain confusing "legalese" and lengthy case analysis. New York Legal Assistant Handbook is different, because it tells you what to do and how to do it - in plain English. 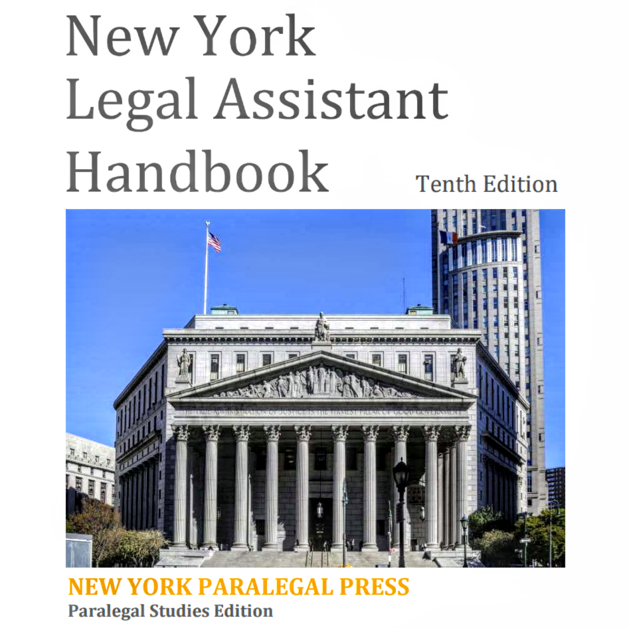 Used by New York Paralegal students and graduates, written by a top-notch team of New York Legal assistants, attorneys and paralegal educators, New York Legal Assistant Handbook provides concise explanations of substantive law and practical "how-to" advice covering a broad range of important legal subjects. Excellent overview of New York legal research procedures and court systems, instructions for preparing research memos, digesting cases, using proper citation form, i.e., Bluebooking, Shepardizing and more. Thorough checklists, forms and strategic advice for creation, modification and dissolution of New York corporations, LLCs, partnerships and more. Detailed forms, checklists, and instructions for assisting with purchase and sales, financing agreements, residential and commercial closings under New York case law and statutes. Detailed drafting instructions, complete plain language coverage of New York Family Court rules and Domestic Relations Law, comprehensive forms and concise summaries of substantive law. Detailed examination of wills preparation, execution, revocation and contest, intestacy and right of election; revocable and irrevocable trusts; powers of appointment; guardianship; conservatorship; estate taxation and planning, according to New York case law and statutes.